Congratulations! Gramma Darling Named the 2017 Outskirts Press Best Book of the Year! It’s been our great pleasure to shine a spotlight on our finest self-publishing authors and their work throughout September. Outskirts Press has been publicizing the nominees for the 2017 Outskirts Press Best Book of the Year — Gramma Darling by Lissa Schroeder, When a Woman Is in Love with God by Darnelle Wilson, and The Thundering Herd by John Peltier. Well, now the public has spoken: Gramma Darling is our 2017 Best Book of the Year! The road to this big win is a long one. Every year, Outskirts Press nominates a very small percentage of the books we published during the previous year for submission to the Colorado Independent Publishers Association EVVY Awards. This coveted nomination is the first step toward qualifying for the Outskirts Press Best Book of the Year Award. Outskirts Press selected three finalists from among the EVVY Award winners to compete in the Best Book of the Year Award contest. You’ve probably seen these authors featured on the Outskirts Press blog over the past few weeks. We’d like to thank the many readers who took on the daunting task of selecting only one of these phenomenal books for the title of Best Book of the Year and the grand prize of $1,500. Lissa, Gramma Darling is more than worthy of the honor — congratulations! 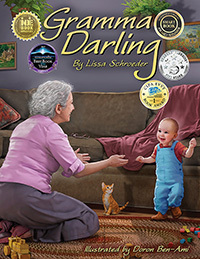 Join us in congratulating Lissa Schroeder for her Best Book of the Year honor for Gramma Darling! Are you looking to market your own book like Lissa Schroeder did? It’s hard to believe but the holidays are right around the corner! Now is the time to start marketing your book for a bustling holiday buying season.